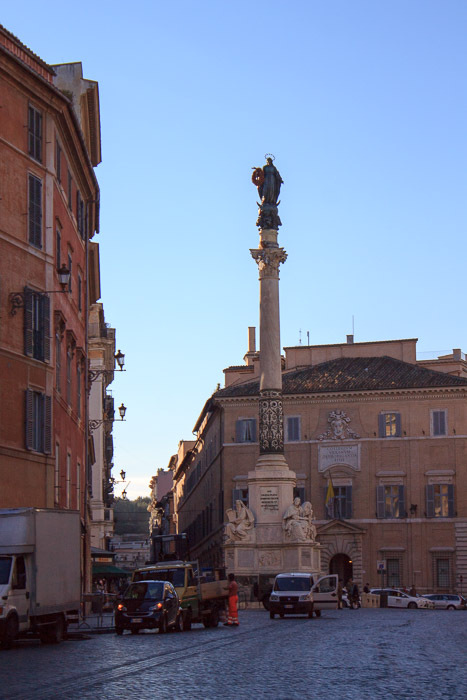 The Column of the Immaculate Conception is a 19th century monument in Piazza Mignanelli, which is a southwest extension of Piazza di Spagna, the piazza at the base of the Spanish Steps. It was designed by Luigi Poletti and dedicated in 1857. The monument has a square marble base with statues of Moses, Isaiah, David and Ezekiel at the corners, each accompanied by a quote of a biblical verse in Latin. 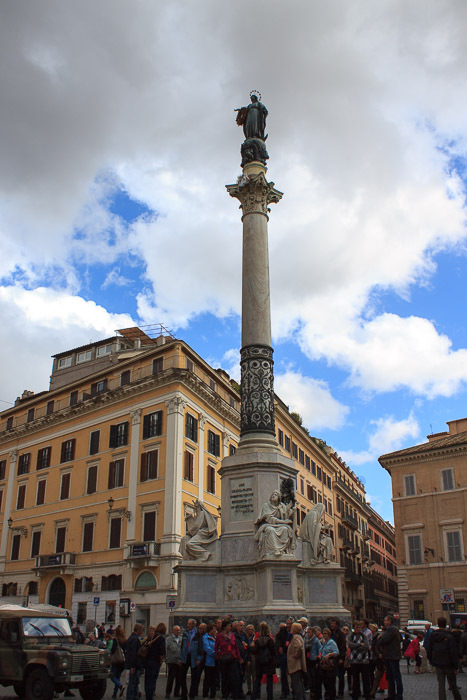 On top of the base rises a 39-foot-tall Cipollino marble column of Corinthian order which was sculpted in ancient Rome and was discovered in 1777 during the construction of the nearby monastery of Santa Maria della Concezione. On top of the column is a bronze statue of the Virgin Mary who is shown stomping a serpent (the symbol of original sin), which is a symbol of immaculate conception dogma of the Catholic Church which maintains that from the moment when she was conceived in the womb, the Blessed Virgin Mary was kept free of original sin. See all Column of the Immaculate Conception photos.